The annual San Francisco Jazz Festival is a perfect reason to come to The City by the Bay. It's also a great time to explore some cool leisure activities around town and the Bay Area too. Groove to Roy Ayers, Los Van Van and Fourplay at night. By day enjoy cool neighborhoods, hot restaurants, fascinating museums, fun day trips and a game of golf. The possibilities are endless in San Francisco. 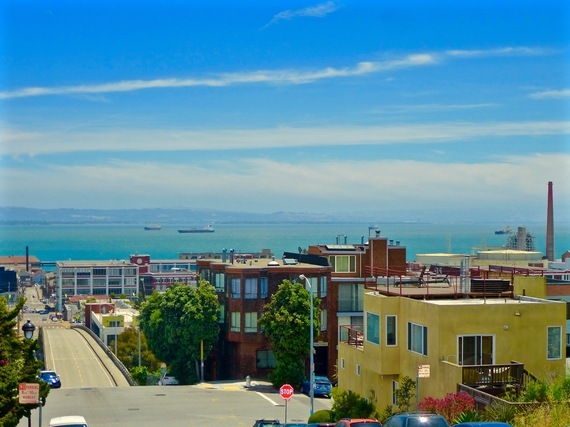 View of the San Francisco Bay from the Potrero Hill neighborhood. The Legion of Honor, with its Romanesque columns, is the city's most palatial fine arts museum. Built in 1924, it sits perched on a hill in the northwest corner of SF, surrounded by the 100-acre Lincoln Park with views of the Golden Gate Bridge and access to the hiking trail Lands End. Vast interior salons are filled with Rembrandts, Cézannes, Renoirs Picassos and sculptures by Augustine Rodin (The Thinker). Check out the special exhibitions like The Future of the Past: Mummies and Medicine plus the Wild West: Plains to the Pacific. Museum of the African Diaspora (MoAd) focuses on the rich cultural heritage of people of Africa and African descent. Started in 2005 at the behest of then-Mayor Willie Brown, the museum has flourished. View the ultra cool exhibit Dandy Lion: (Re)Articulating Black Masculine Identity, a show of images of African, Jamaican and American men who express their art with their clothes. Also take in the exhibition of an iconic '80s singer: The Grace Jones Project. Grace Cathedral was founded in 1849 during the great Gold Rush, on stately Nob Hill near downtown. It was destroyed in the 1906 earthquake and rebuilt to its current splendor in 1964, when, upon its completion, Martin Luther King gave a sermon in the church to 5,000 guests. Today it features nearly 7,300 sq. ft. of stained glass windows depicting figures from the Bible and even Albert Einstein. South of Market (SOMA): The Keystone, a neo-classic tavern, attracts tourists and folks looking to hang out after work. Chef Banks White, who is from Texas and has a predilection for Asian cooking, influences its eclectic cuisine. Drink a Porcini Negroni (Beefeater Gin, Porcini, Cappelletti Aperitivo, Vya Sweet Vermouth and eucalyptus). Move on to the South X Southeast Fried Ribs (soy & calamansi glaze, pickles, fried garlic okra) then devour the Thai Style Fried Chicken (haricot vert, chilis, fermented bean & red curry sauce). The Fillmore District: Back in the 1940s, The Fillmore was a thriving black community--the Harlem of the West. Nightclubs with names like Jacks of Sutter attracted Ella, Billie and Louis. Chef David Lawrence and his wife Monetta White bring the good ole days back with their restaurant/bar/music lounge 1300 on Fillmore. A club room features a wall with famous black faces from the past. Lawrence's French cooking skills, Southern tastes and fresh California ingredients are evident in the signature Fresh Water Shrimp Hushpuppies appetizer, the Barbecue Shrimp N' Grits and Bourbon Mac & Cheese with cornbread crust. Billie would have loved this place. Nob Hill: The Big 4 at The Scarlet Huntington hotel serves classic American dishes in a clubby space with rich dark wood walls, white tablecloths, piano music, and a gallery of historic SF photos from the 1800s, when The Big 4 railroad tycoons (C. P. Huntington, Charles Crocker, Mark Hopkins and Leland Stanford) were the toast of San Francisco. Ease up to the Dungeness Crab Cakes (Lobster Sauce, Roasted Corn Relish) and go hearty with a New York Strip Steak and Potatoes (with Sour Cream Mashed Potatoes and Red Wine Bordelaise). Then sit around the piano and ask Susie the pianist to play her sweet rendition of "My Funny Valentine." Downtown: Parallel 37 at The Ritz-Carlton, San Francisco has a market-driven menu focused on the best local and seasonal produce. That's chef Michael Rotondo's goal. For an intro, his tasty Gazpacho Soup is served in a bowl and poured over bits of ham. The Spring Pea Agnolotti pasta (burrata, spring peas, basil) makes both a delicate and flavorful second course. The Herb Crusted Rack Of Lamb (48 hour braised shoulder, potato gnocchi, arugula) is tender and soft as butter. Fisherman's Wharf: Serving 100% sustainable seafood is a hallmark of the very popular Fog Harbor Fish House on Pier 39 in Fisherman's Wharf. Three generations of the Simmons family have owned and operated this restaurant with its dramatic views of the Golden Gate Bridge and San Francisco Bay. The panorama thoroughly compliments the traditional sourdough bread and award-wining Clam Chowder. To get a feel for the menu, try the tasty Mixed Grill Dinner (tender salmon, swordfish and shrimp, with citrus beurre blanc, sautéed vegetables and garlic mashed potatoes). Half Moon Bay: Dine at the classy, ocean view restaurant Navio at The Ritz-Carlton, Half Moon Bay and let Chef Pringle take you on a personal culinary journey with his Seasonal Tasting Menu: Shima Aji (sushi with cherries, green almonds, coriander), Cacio e Pepe (Black Pepper Lemon Fettuccini, Grana Padano Summer Truffles). Monkfish Roti (Razor Clams, Tarbais Beans, Peking Duck). Boating on the Bay: Hornblower Cruises & Events takes you out on SF Bay, from Pier 3 in the Embarcadero, for two-three hour dinner, brunch, lunch and supper club cruises. The boats feature two floors of reserved tables, a lavish buffet and live music for one price. As you set out, you view the Oakland Bay Bridge, the cities of Berkeley and Oakland in the distance and pass Alcatraz Island. When the boat sails under the iconic Gold Gate Bridge, the emcee gives a shout out to passengers who are celebrating graduations, anniversaries and birthdays. A unique winery: Brown Estate Vineyards (https://www.brownestate.com) is the first Black-owned estate winery in famous Napa Valley. In 1980 Dr. Bassett Brown and his wife Marcela Abrahams Brown bought 500 acres in Napa renovated the property, planted vineyards and sold the wine grapes for ten years. In 1995 their children, Deneen, David & Coral, started producing and selling red Zinfandel under the name Brown Estate. Vintage, exquisite tasting wines like the very zesty Rosemary's Block helped the winery become one of Napa's most respected. They do a booming online business, so you can order in. Golf among the grapes: The Chardonnay Golf Club & Vineyards, run by the affable PGA General Manager Roger Billings, opened in 1986 with an 18-hole golf course on 350 acres that meanders around vineyards ripe with Chardonnay grapes. Located in the Napa Valley, with views of empty hillsides, legendary football players like Jerry Rice and Joe Montana as well as Michael Jordan have played the course. Easily what they're attracted to is the serenity, setting and a club that is very accommodating. Hone your technique with a lesson from First Assistant Golf Professional Jeff Robinson. A room with a view: Forty-five minutes south of San Francisco, on famous Route 1 with its dramatic views of the Pacific Ocean, the road leads to the coastal town of Half Moon Bay and The Ritz-Carlton, Half Moon Bay. It's one of the most gorgeously set resorts in the country. The latte-colored New England looking building sits on scenic bluffs with spectacular ocean views. The resort was named one of Tennis Magazine's "Top 50 U.S. Tennis Resorts." Get tennis pro Wes Hollon to work on your game, and if you're lucky you can play a set with his protégé Charlie Underwood. He's all of nine-years-old and a dragon slayer. Golfing with a view: Play the 36 holes at the Half Moon Bay Golf Links and teeing off to the vistas of the Pacific Ocean is like magic. There are two championship golf courses: The historic Old Course features cypress trees and an 18th hole overlooking the ocean, which was favored by Joe DiMaggio back in the day. The very challenging Ocean Course, with its narrow greens and rugged terrain, has hosted Steph Curry. And former Secretary of State Condoleezza Rice has played both courses. First Assistant Golf Pro Anthony Maestrini will guide you to a better swing. A Nob Hill retreat: The Scarlet Huntington crowns the tony Nob Hill neighborhood and is catty corner to Grace Cathedral. With views of downtown and Marin county in the distance, this blending of tradition, a boutique style and vast, apartment-sized rooms and suites gives guests the best of all worlds. The redbrick façade looks historic and the tony colorful lobby and rooms with eclectic interior design are post-modern. Their peaceful Nob Hill Spa features massage and beauty treatments, a pool and an outdoor veranda. The hotel mirrors the best old and new elements of San Francisco. On the cable car line: Newly renovated, The Ritz-Carlton, San Francisco is steps away from the California Street Cable Car Line, Chinatown and Union Square. The majestic white ivory colored exterior looks like quartz rock. The very elegant interior lobby, with its marble floors opens up to a swank barroom with live entertainment at night and the elegant Wellendorff jewelry boutique. The rooms and suites start at a spacious 600 sq. ft., go up to 1980 and have an eye-catching contemporary style. Lots of blues, grays, whites and fancy textures. A complimentary house car is available for trips within a one-mile radius. The annual San Francisco Jazz Festival comes every June. But you don't have to wait that long to come to SF for jazz or a luxury vacation. The SFJAZZ Center on Franklin Street programs music and concerts all year long and the city is equally tempting 365 days of the year.